Is It Time for Retail Account Analysis? Fellow Gonzonians, there is no shortage of conversation on the conference circuit, in between munching the chicken and peas, about the impact of the new, opt-in regulations on overdraft revenue. Everybody knows revenue will decline, but there doesn’t seem to be any early consensus about the extent to which it will. This is, or course, no small matter. Based on data we collect from clients, more than 80% of deposit account fee income now comes from overdraft fees and debit fees. Less than 20% comes from monthly service charges. Perhaps a touch of history is in order here. For many, many years, monthly service charges were the non-negotiable source of fee income on checking accounts, and the major contributor to profitability. Maybe the fee could be avoided with a whopping average collected balance, but most customers coughed up the fee. Life was good, revenue was predictable, and skies were blue. Then came the “free checking” land rush. If you think about it, this was essentially a large-scale trade of monthly service charge fees for transaction-based fees like O/D and debit. There is no doubt that trade has been positive to this point. But now, with that revenue in some degree of peril, there is an understandable discussion beginning about the need to re-visit monthly service charges and other account-based fees again. But, before we go too far down that road, let’s ask ourselves something. Rather than re-thinking flat monthly service charges, is it time to think about analyzed retail checking accounts? Account analysis for business checking has been around since Trigger was a frisky colt, and it’s a pretty simple concept (apologies to everyone in Deposit Ops who actually have to make it work after the friggin’ consultant says it’s simple). Add up the cost of serving the customer for a month – check processing, cash processing, ACH/EFT/ATM services, etc. Calculate fees paid. Give an earnings credit for what has been deposited. If credits cover costs, the account is free for the month. If not, a fee is charged. Financial institutions with business accounts have had this for years. Actually, many of the retail rewards checking and high yield programs offered now are based on the same concept. The higher interest rate is paid based on the customer performing some number of total or signature debit transactions that clearly make the account profitable. The difference is that these programs are usually more “broad stroke” in their application, i.e. generally customers make the transaction threshold or they don’t. Even so, this is a quasi form of account analysis in place today. It is customer-centric, not based on broader rules, which is very consistent with the approach many are taking to retail banking. Each customer can be judged and paid/charged based on their exact behavior every month. The systems are already there to do it – business systems have been analyzed for years. Some adjustments may need to be made (like breaking out sig and PIN debit revenue), but account analysis systems are fairly robust now, and those adjustments would likely not be major. There could be some interesting ways to offer personal/small business packages to customers. Most systems can allow personal balances to be used in business analysis and vice versa. Account analysis strips the onion on account profitability with customer-specific information. Sure, it’s not full-blown customer profitability, but so what? Neither are rewards checking or high-yield checking. Besides, if the core relationship is profitable and the customers that are producing the most revenue and costing the least are getting rewarded, aren’t we where we need to be? Most bankers have a goal of moving self-service transactions to lower cost channels. Account analysis may be a good way to reward that behavior through a lower cost (or no) allocation for Internet, IVR and other non-branch channels but a higher cost for branch and (maybe) live call center transactions. Banks that are into some kind of rebate program for debit usage could easily incorporate that same reward into account analysis. Customers could view the rules of account analysis as being too complex and the monthly analysis itself too confusing. There is no doubt that product simplicity is an advantage in the marketplace, “Everything’s free” being a good example of that. However, the rules of rewards/high yield checking are already somewhat detailed, so there is at least some evidence that buyers will read more complicated disclosures. Besides, it is certainly reasonable to think that the public will buy the overall theme of this, which is that if they make the institution enough money through behavior, they won’t get charged and may get rewarded. There would be costs associated with such a program. The first could be extra mailing/delivery costs to get the analysis delivered to a customer. There are ways to avert these costs, though. One is through electronic statements, which many institutions are well into anyway. The second may be an analysis period that is less than monthly. There’s nothing to rule out a quarterly analysis or some number less than 12, particularly if the goal of the program is to re-qualify customers for “free” status. Information would not be perfect. For example, it would not be possible to obtain or use the exact debit revenue by transaction/merchant and apply it to any analysis. The data isn’t that granular. However, some kind of blended income credit, while not perfect, would probably be pretty close. The second cost would be with the data processor to actually perform the analysis. Many institutions are on a variable cost structure for current business accounts with analysis, the cost of which can be fairly high. That could be a tough thing to overcome. However, any vendor should be willing to consider a price adjustment, if necessary, to get what would be incremental revenue from its customer. Right? Vendors? All this said, there is the understandable risk of being the first financial institution in the area to push this idea. If nothing else, the “free checking” billboard is effective. Showing the same billboard with beautiful, ripped young people smiling on the tennis court or holding up a Mojito while partying at the nightclub with the caption “Our checking account is analyzed!” doesn’t have quite the same panache. You got me there. But product and pricing has always been the art of balancing marketplace appeal with good profitability. Managing that is nothing new for good bankers. There may be some variants of this idea to consider. One is some partial application along the 80/20 rule (80% of profits come from 20% of customers). Maybe the 20% that are clearly profitable are left alone and the 80% are put on some kind of analysis. Maybe it is done with the bottom 25%. Or, maybe key retail accounts are put on analysis first to get a better idea of account-level profitability. For example, heavy users of branches/tellers could be put on analysis to better see their true costs. The same for people who still write checks instead of using debit. Hey, we all don’t write many checks anymore but 20 billion or so checks are still being written, so somebody is doing something with ’em. If nothing else, assuming that costs are not prohibitive, there may be very good reasons to put retail accounts on analysis just to start building a good body of information about who’s making the institution money or not. There is going to be some kind of return to account level fees over the next few years. Management teams and boards are all asking how they can partially offset reduced debit fees after opt-in is required. This conversation will only get tougher if interchange revenue is the next thing to get in the regulatory crosshairs or if even tougher overdraft rules are enacted. Full-blown retail account analysis may not be the perfect full-blown answer. But it certainly has a place in the debate. ARE YOUR RETAIL FRONT AND BACK OFFICE AT PEAK EFFICIENCY? Retail Banking is among the hundreds of benchmarking measurements included on the Cornerstone Scorecard®, a valuable tool that can be utilized to assess your organization’s performance, set goals for the future and hold management accountable for measurable performance improvement. Under the Retail heading, we also look at Direct Banking, Call Center, Retail Administration and Retail Non-Interest Income. 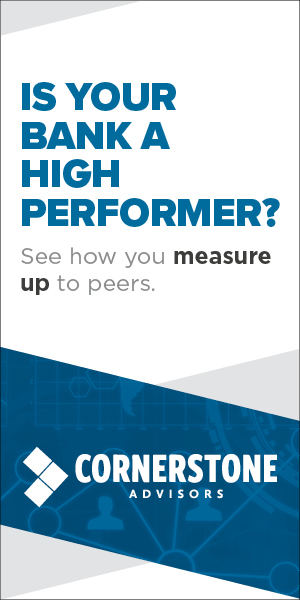 A customized Cornerstone Scorecard® enables your organization to measure its numbers against peer benchmarks. In addition, The Cornerstone Scorecard® gauges the organization’s performance in key fee income and non-interest expense categories. Visit Cornerstone’s Web site or contact us today to learn more. We here at The Weiland Financial Group live and breath account analysis – in fact, besides electronic bank account management – it’s all we do. As such, we have thought long and hard about going “retail” with our solutions but haven’t seen too much interest until recently. Some of our customers already run their small business accounts through the system while others are considering running personal accounts as well. From what we’ve looked at, it’s definitely possible and depending on the bank, has a considerable amount of upside. Depending on a bank’s profile, we often suggest running your small business accounts through account analysis before jumping straight into personal accounts. Many banks still run service charges for their small business accounts through their DDA systems (as opposed to an Account Analysis system) and as a result regularly leave money on the table. As newer treasury services trickle down to smaller accounts and concerns about fraud and compliance become ever greater, these accounts will rack up service fees that should be charged for in a detailed, data rich, manner. Offsets may be used to attract business as well as incent higher balances to be kept at the bank by using a tiered earnings credit rate or equivalent. In fact, it is beyond us why more banks don’t run their small business accounts through analysis – the benefits so outweigh the downsides. As far as your “challenges” are concerned, the level of complexity depends on the bank’s objectives. Banks can use product family pricing strategies, minimum fee arrangements, and a host of other methods to simplify the billing side and the same can be said of the offset side. Ultimately, the complexity comes down to a PR effort – as with any new service offering, you need to explain the basic concept and then keep additional detail always available at the customer’s finger tips by having linked explanations on electronic statements that define terms and explain charges etc. On the costs front, electronic statements are definitely the way to go. In fact, besides cost cutting, in the long term, this could become a source of revenue by charging for paper. We have customers charging their commercial and small business accounts a fee for paper statements right now that they justify by going “green”. I don’t think personal retail accounts are ready for this quite yet, but it will happen eventually. As far as processing costs are concerned, our CAA system is available On-Premise, SaaS, and even Outsourced – so it all depends on the bank’s needs. With SaaS, our variable cost structure ensures customers only pay for what they get and helps eliminate IT costs. And while we think our prices are extremely reasonable, you are right to say that some business is better than no business – that is to say, yes, I think vendors would be willing to negotiate terms in order to make retail account analysis a win-win. We are more than happy to discuss retail account analysis (as well as all other forms) with anyone anytime – it is our passion. Terence, I think you bring up a good suggestion here for institutions to think about. I like how you pose the potential issues with this approach but you bring some good alternatives or test models to the table to help avoid the problems that could occur. In my opinion, the only true way to ensure fee income remains somewhat stable is by doing more with existing and new customers. By restructuring your pricing model for existing accounts to offset lost revenue you’re essentially placing a band-aid over a gunshot wound. The free checking mindset is not going to be easy to change. Just look at the airline industry and the pay for baggage issue. How many times have you flown on a flight where your bag cost $15 or $20 just to put under the plane. I bet you heard at least one or two customers of that airline complaining while in line. That keeps up, the other airlines that kept their bags free (i.e. Southwest) will reap the rewards. Now, I understand that those complaining maybe the customers who are costing you money instead of making you money. But those types of customers add up and the more that flee your bank, the more they talk about you in a negative way, could have drastic effects for your brand down the road. There’s a huge opportunity for banks and credit unions to be the complete financial provider for their clients. Only a handful of institutions have been successful at doing so and even they will tell you they’re no where near their potential. Good discussion and ideas. Hope others chime in.